Sorry for kind of dropping of the face of the EARTH for awhile. And while in the Czech Republic none the less. It's probably a really good thing I probably saw everyone that reads this blog over the holidays so I'm sure no one was too concerned with my absence. I did get home from the Czech Republic...eventually. I'll explain that later. I really just wanted to share pictures with you. On December 2nd, Dublin turned 1. In true Lundberg fashion, I made him a cake for his birthday. Because our dog just tends to eat things whole, I thought giving him a few cupcakes would work a bit better. I'm pretty proud of my skills. The original plan was to make him a cake with the left over fondent in my freezer with Jen and Danielle. Because of the Czech trip, that craft day was cancelled so this is what he got instead. Here he is in the obligatory milestone monkey picture. I seriously can't believe how big he's gotten. Everyone that see him tells me he's huge but he's still my little puppy that used to be able to curl up in a ball on my lap and now is lucky to get his head in my lap. Here he is eating his cupcakes. For the entire week I was gone, Shad said he would go over to the table outside and sniffed it looking for more cupcakes. Silly dog. 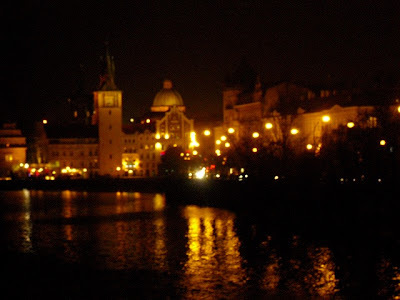 Now on to my Czech Republic pictures. This was a picture of the wall to the church in the town square. I thought it was cool they had all these little niches with statues all around the church. The town square in Hradec Kralove where I stayed for the week. I wasn't kidding when I said it was dark there. Some closer town square lovin'. 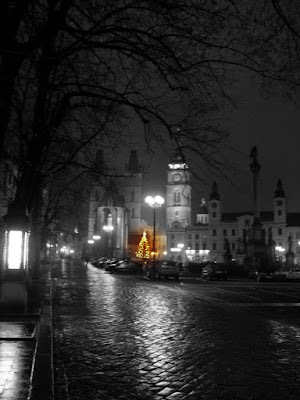 I really like the Christmas tree in this picture. Not so much in focus but it was raining and dark so I don't blame my camera for rebelling. 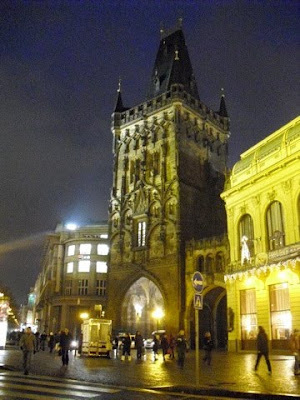 Now onto Prague. 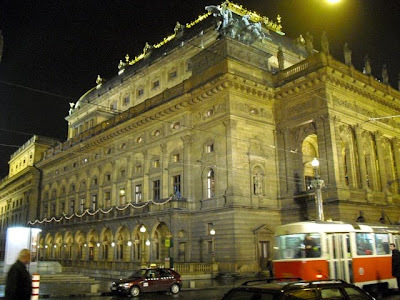 So the Friday of my trip I left work at noon and took a taxi back into Prague (about 2 hours) so I could spend my last night in Prague exploring before my plane left Saturday. Such an awesome decision! 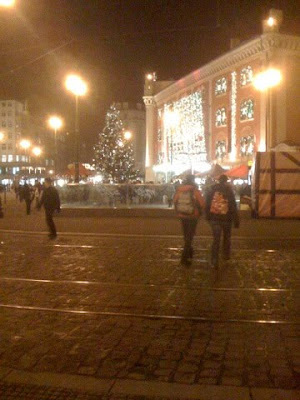 This was in republic square. From what I could tell most of these buildings are government buildings or churches. I loved that there were trams everywhere - not that I actually figured out how to ride the trams or trusted myself not to get lost on the trams but they were still cool to see. 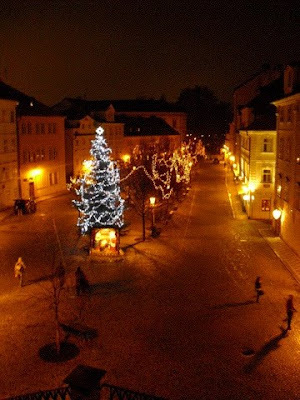 The Old Town section of the city all decked out for Christmas. Pretty bulidings from the bridge. 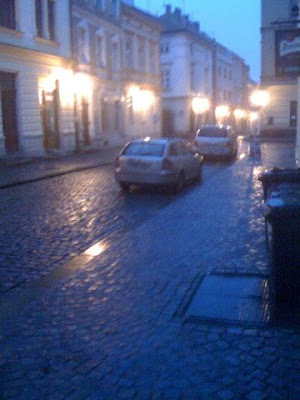 This is the street I stayed on in Hradec Kralove. More pretty buildings. 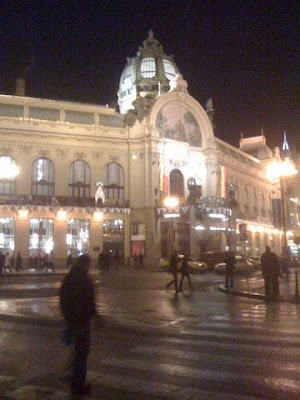 And just so you know, my camera died in the middle of me wandering around Prague so my Iphone got to fill in. That's why these pictures are less pretty. 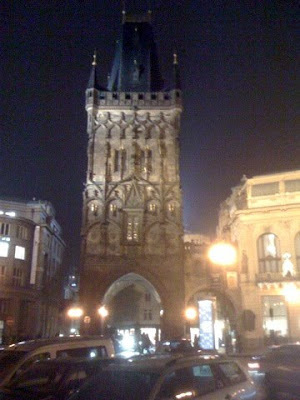 This is a tower that was at the end of the walking bridge to cross the river in Prague. I think I'm going to hang this last picture in our house for Christmas time. Gotta love the powers of Picnik. I'll update on the other goings on of our house later. For now, just enjoy the pictures. Thank you for posting those pictures! I have been wondering when we could see them. I like what you did to that last image. Very cool. Can't wait to know what else you have been up too. Like way awesome tea parties! Awesome pictures! Happy birthday, Dublin! What a cute doggy!!!!! Love him!